We offer full service dubbing and localisation for Games, Film and TV in most languages. From casting to video layback we can manage your most demanding projects with top quality and on schedule. We can handle custom auditions and casting to find the perfect voice for your dubbing projects. Get our language director to choose the best talent for your needs, or choose the voices yourself. Since we have studios in China and partners in other countries, you can be sure the talent is a native speaker with as neutral accent as possible. We can manage your entire production, and you can be involved as much or as little as you like. We can coordinate the schedule, cast and book talent, and deliver as you require to meet your deadline. We have native Chinese and English translators on staff, and have partnered with several ISO-certified translators to translate up to 80 different languages. We try to use a translator that is fluent in both the original language and language you need to translate so that any idioms and slang will be conveyed accurately. We also consider the length of the original language for synced dubbing because this needs to be considered especially when you’re dealing with Asian languages that may be longer. We can adapt your script to improve lip-sync and cultural reference for your target audience. Synced dubbing in multiple languages. 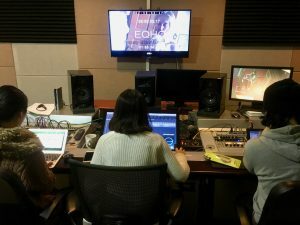 Our talent and engineers will maintain the feeling and tone of the original audio and deliver a performance that conveys the meaning accurately for target language, despite cultural differences in ways of communicating certain ideas. Layback to video, mixed audio files, stems or even the entire projects, we will deliver on time with any requirements you have in the most convenient way possible. Even the most unique requirements may not be a challenge for us. Even if we’ve never done it before, we are quite adaptable having worked for 10 years in mainland China, Just let us know what you need. Your project will be delivered with the quality and requirements you expect without any surprises or sudden additional costs or delays. We’ve been doing this over 20 years. We know what were doing!